We live in a world where most people won’t pull you up for something. People will feel rude to give you advice regarding your dress and bearing so no one utters a word. So, out of being polite and respectful people just let you carry on. I for one would love to be told if I’m doing something not so right so I can correct myself. Unfortunately, to be honest and forward with someone can be misconstrued as rude – we live in a world where preserving feelings is more important than conveying facts. Criticism is great, it makes the learning process quicker! But that’s not what this blog is about. While this isn’t a definite no-no, a business shirt connoisseur (if such a person exists) would say don’t wear a black shirt during the day. Black is generally attributed to evening wear. Stick to light to medium colours, not only are these a more suitable dress option in but they are just more vibrant in general. Gents, tighten your ties! 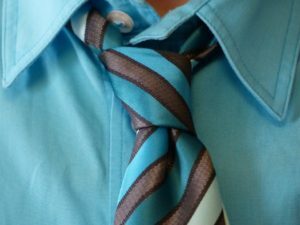 It’s understandable that sometimes they might come a bit loose during the day but make it a habit to occasionally give your tie the tug. Nothing looks sloppier than a tie that has become loose. Get a haircut, please. It’s for your own good. Talk with pride, talk with conviction. Deliver your facts strongly! If your verbal composure is such that it is mumbled or flat, as if you’re talking to your mate at 2AM while eating a pizza and drunk, then you’re doing it wrong. Talk with clarity – it will give you that edge and authority about you. Hands out of your pockets. When you’re providing customer service, talking to a client or even talking to your boss, make sure your body language is not sloppy. This includes keeping your hands out of your pockets, not leaning against something and depending on the situation – not having your arms crossed. Start to self assess your composure and consider these points. Self improvement is a great thing but a very dangerous phenomenon is “not knowing what you don’t know”. If any of these apply to you then now you know and you can correct them.